Helpful small business blogging guide is available now at no cost to any small business at CorpNet.com. Most small business owners know that having a business blog can help them gain more customers and increase sales. They just don’t always know where to start. CorpNet.com, a leading online business document filing company that helps entrepreneurs start a business and keep a business in compliance, is helping small businesses make the most of their social media and digital marketing efforts. 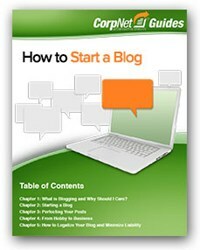 The company announced that its publication, “How to Start a Blog,” is now available for free download at CorpNet.com’s website. Geared toward small businesses, “How to Start a Blog” teaches the basics of setting up a blog, writing great content, and increasing readership and potential customer base. Readers will learn how to come up with topics that customers want to read and establish trust with the audience. In addition, the guide offers tips on how to share posts through social media to increase reach and readership. “This year, our goal has been to provide our small business clients with a wealth of free resources to help them start and build a successful business. Most small business owners know that having a business blog can help them gain more customers and increase sales. They just don’t always know where to start,” said Nellie Akalp, co-founder and CEO of CorpNet.com. The new guide on blogging joins other helpful resources on CorpNet.com to address some of the most pressing small business questions, such as Starting a Business Checklist, Social Media Tips for Every Small Business, How to Get Press Coverage, LLC Basics, and Filing a DBA. CorpNet.com has helped more than 10,000 businesses form since 2009, helping small businesses across the country form an LLC or Corporation, file a DBA, keep their business compliant, and more. The company has made a name for itself for its personal touch, fast and reliable services, and flexible packages that meet the needs and budget of any entrepreneur and business. In addition to its helpful small business guides and publications, CorpNet.com recently launched Business Information Zone (B.I.Z.) to help companies stay in corporate compliance by keeping track of all the important state filing and tax deadlines. Other tools include the Business Structure Wizard to help customers pick the best business structure and free meeting minutes templates.